My guest for this coming Wednesday’s installment of Economy Talk is Dr. Richard A. Levins, author, lecturer and Emeritus Professor of Applied Economics at the University of Minnesota. Dr. Levins has been doing a lot of thinking about the middle class and he is working with me on a re-write of my book, The Middle Class Amendment (If you haven’t read the first booklet click on the title. You can check out Levins publishing here and read some of his commentaries. 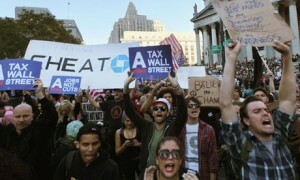 We talk about the prospects for the middle class and size up what’s happening with the Occupy Wall Street movement. If you have suggestions or comments for either Dr. Levins or myself contact me. So e-mail me at david@davidbly.com and tune in Wed. October 12th at 6pm for an interesting discussion on KYMN radio 1080AM or listen on line here. The archive is posted here. You can join the movement to call for a Middle Class Amendment by joining my facebook page here.